As a trainer, I am always looking for different ways to help my clients and group participants reach their goals. Sometimes it includes bodyweight only exercises, and sometimes it includes the use of equipment. Every time it includes keeping them interested with constantly changing workouts, not to mention changing movements and having them use their muscles and joints in different ways to keep the training balanced. 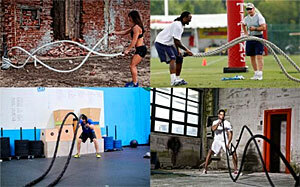 The Battling Ropes or heavy rope is a piece of equipment I use to vary my clients’ training. Here are some effective ways I use it to help my clients reach many different goals and keep them interested and focused. There are specific techniques that will help you to get the most out of your heavy ropes sessions. Let’s begin with the importance of your stance. Your stance will help you stabilize your body and help you transfer power through your hips and trunk to your arms and finally to the ropes. Stand with your feet a bit wider than shoulder width apart, and slightly bend your knees. Push your hips back and lower your center of gravity just a bit for a very stable stance. Keep a tall spine with an open chest, brace or activate your core, and you are ready to begin. The main goal of Battling Ropes training is to move the ropes in a way that results in making continuous large wave-like movements with the ropes. There are endless rope exercises. Making alternating waves or thrashing from side to side, are only a couple of exercise techniques. Others include double wave slams and sidewinding snakes; you can change your grip style, overhanded or underhanded. The movements of your arms can be varied by focusing on different joint actions to change the muscle groups being targeted. The main difference between Battling Ropes training and weights is that constant movement must be maintained to keep the ropes flowing. With dumbbells or a barbell we get that brief moment of relief at the bottom of the movement. With heavy rope training, we have to maintain the force and speed of movement to keep the ropes moving. This is something our upper bodies are not used to. John Brookfield describes this as velocity training, the ability to keep the movement continual at the same speed. Velocity training gives the body something that dumbbells and barbells cannot. As a large piece of equipment, a heavy rope may not be as easily transported or stored; it is however, one single piece of equipment that can be used for many training needs. Depending on whether your heavy rope workout consists of explosive bursts of effort, or moderately pacing your moves to keep the waves flowing for several minutes, Battling Ropes can be used to train either anaerobically or aerobically. You can increase the difficulty and even more muscle activation by adding for example, side stepping lateral movements in the lower body. For even greater challenge to your balance and deep core muscles, hold your stance in a kneeling position while working the ropes. You can creatively lessen the intensity of the rope work and increase the coordination challenge by combining or sequencing upper and lower body movements to build workouts that emphasize multitasking of movements. Add pulling exercises as well: standing upright, kneeling, reverse, or lateral pulls, even pulls from a variety of lying or planking positions can be progressed to in a heavy rope training program. You can time intervals as in a circuit with other exercises and equipment, or you can do rope only training. 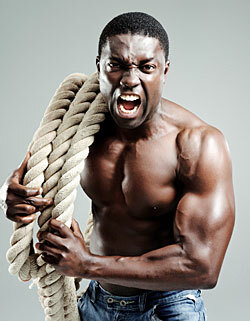 Rope only training is the most effective way to increase Battling Rope skills and duration of time. Whether in a boot camp with creative drills, or one on one training, the possibilities are truly endless if you combine imagination with your client’s goals and capabilities. Who can benefit from Battling Ropes training? Most everyone can benefit from Battling Ropes training; beginners, older adults, athletes, military, police, and firefighters, seniors, and even children; the use of Battling Ropes can truly be modified to just about anyone’s needs and fitness level. Because of the work emphasis of the shoulder joint/rotator cuff, and because the heart rate can rise to near maximal within minutes, those with heart problems and shoulder conditions need more specific doctor recommendations on when and how to introduce heavy ropes to their program. They will need exact input from their doctors on using the Battling Ropes in very specific movements, at very specific intensities. 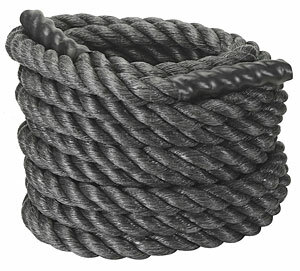 You can purchase heavy ropes at several training equipment sites including Amazon.com, however, you can purchase the official Battling Ropes at Powerropes.com. These superiorly constructed ropes are specifically designed by John Brookfield, the creator of the heavy ropes training system, with an emphasis on comfortable grip and materials for long term rope durability. I own both the economy and the original polyester rope, 50 foot, 1 ½ inch grip diameter, and regularly train with them on cement. After three years they are still in exceptional condition. The cost of the 50 foot ropes starts at $119 for the economy rope, and $155 for the original polyester rope, up to $300 – $375 for the 100 foot ropes, plus shipping and handling. All are durable, made of non-fraying material, and come in sizes 50 or 100 feet in length, and 1 ½ or 2 inch grip diameter. If you don’t have a post to secure the ropes, you can purchase a Battling Ropes Training System post so you can train with heavy ropes where you need them. Battling Ropes or heavy ropes are a valuable full body strengthening and conditioning tool that can be used in infinite ways to achieve countless training goals. As always, exercisers and fitness enthusiasts, for the safest and most effective individualized training programs, hire a certified trainer who is also certified in heavy or Battling Ropes techniques. Trainers certified in the Official Battling Rope System are trained by the creator of the system, John Brookfield, himself. From conditioning the heart and lungs, to gaining muscle strength and endurance, to challenging the brain, Battling Ropes training can be creatively used as a versatile tool that will keep your clients and groups coming back for more. Have you tried Battling Ropes? What’s your take? Let us know in the comments below!